First off – the packaging – the box is very classy in black with red accents and looks expensive and upon opening it I was treated to a view of the beautiful chocolates inside. Each one has a different shape and color (as you can see below) and they really are beautifully made – I can’t imagine anyone that wouldn’t be thrilled to open this box and consume the chocolates inside. To try these, we decided to do a group review of them after a nice dinner with a friend – so we had three adult reviewers. We didn’t read any of the website descriptions before trying. I’m not sure if that as a good or bad way to do it, but it seems like that would mimic how a consumer would actually try these. We read the descriptions after we tried them. We took notes from the three adults trying them and combined them into our overall thoughts on each flavor. The order below is the actual order we tried them. 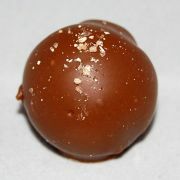 Website description: The natural flavor of amaretto provides the focal point for this truffle. 60% dark chocolate is mixed with fresh cream, butter, and Amaretto Liquor. 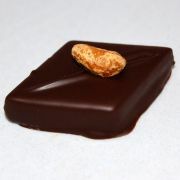 We encase the ganache in a 60% dark chocolate shell. Our thoughts: Super-smooth, creamy, and light, and not overpowering. Delicious! As close to perfect as it gets. One of the best ones we tried. 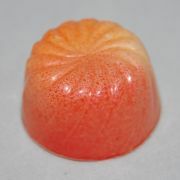 Website description: Pure almond paste, pistachio paste, and a splash of Cherry Heering liquor mingle in this marzipan textured filling. We hand cut and dip this truffle in 60% dark chocolate, before topping with a pistachio – adding just the right amount of salt and crunch. Our thoughts: We didn’t care for this one at all. I’m not a fan of marzipan and the two other tasters didn’t care for this either. The texture was odd and unexpected in a chocolate and seemed very dry. 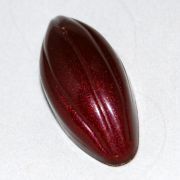 Website description: Our raspberry ganache is a Customer favorite, and for good reasons! Pure raspberry puree, caramelized sugar, and dark chocolate swirl together in the smooth ganache filling. 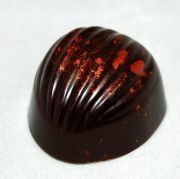 Encased in 60% dark chocolate, this truffle reminds us of summer days spent picking fresh berries. The flavor is unmatched! Our thoughts: We all thought this one was good, but not great. The raspberry flavor hits you at the end and a few of us thought it tasted like raspberry jam, We were hoping for more of a raspberry flavor hit. Still good, just not as good as we wanted. Website description: We took two classic flavors and paired them to make another of our Customer favorites. We make our own coffee caramel by infusing fresh cream with vanilla coffee beans, and mixing with caramelized sugar. Milk chocolate is then added, in order to make a smooth consistency. A second layer of dark chocolate vanilla ganache is added. Encased in a 60% dark chocolate shell, the two layers provide a perfect balance of taste. Our thoughts: OMG good! The coffee flavor was subtle but delicious. One of the stars of the box. Website description: Buttery wafers mix with pure hazelnut praline and milk chocolate to create this irresistibly crunchy treat. We finish it off with a coating of milk chocolate, and a drizzle of dark chocolate! Our thoughts: This one had a crunchy cookie-like texture in it that was pretty tasty. For some reason it reminded me of Trix cereal, but the other two tasters thought I was crazy. There wasn’t a ton of hazelnut flavor, but what was there was good. We all agreed it would get a 3 or 4 on a 5-point scale. Website description: We take creamy peanut butter and sweet white chocolate, and mix it in just the right proportions. Encased in a twice dipped milk chocolate ball to balance the flavors, this truffle is sure to please peanut butter lovers everywhere! Our thoughts: The peanut butter/white chocolate mixture made for a much creamier peanut butter filling than we were expecting. The filling tastes of peanut butter but much smoother and it had less of a peanut butter kick than we thought it would have. Very good – we rated it 4 out of 5. 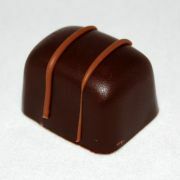 Website description: Our dark chocolate truffle is pure 60% dark chocolate, mixed with fresh cream and butter. We enrobe our ganache filling in two coats of dark chocolate. Simple ingredients, yet anything but simple in flavor. Our thoughts: Not too sweet – very smooth. even the one taster who didn’t like dark chocolate liked it. We all agreed it was easily a 4 or 5 on a 5-point rating scale. 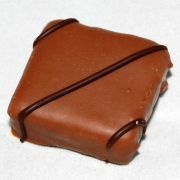 Website description: Like all of our ganache fillings, this caramel is homemade. 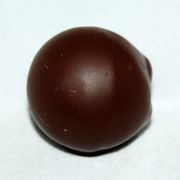 We pipe a thin layer of our homemade caramel into milk chocolate balls, before mixing the rest with rich milk chocolate. 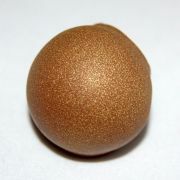 Not your typical caramel, yet the incredibly smooth caramel filling will leave you longing for more. Our thoughts: Buttery, super-smooth, and incredibly delicious. This caramel is very thin and oozy, not hard and chewy. Wow, it’s good. A+, 5/5. Website description: Our passion fruit truffle combines pure passion fruit puree with sweet white chocolate and fresh cream. A touch of Galliano Liquor rounds out the superb flavor combination! Our thoughts: We all agreed this had a serious passion fruit flavor kick and was quite delicious. It scored a 4 or 5 on a 5-point scale. Website description: Key West lime juice mingles with freshly grated lemon zest in this creamy custard-like filling. Nestled in a white chocolate shell, the perfect blend of lemon and lime is a delight for all! Our thoughts: After trying the passion fruit, this one just didn’t have the flavor kick we expected. It was good, but not great and needs more of the lemon/lime flavor to kick it up a notch. 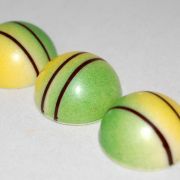 Website description: We infuse fresh local cream with Verbana Mint tea leaves, and combine with sweet white chocolate. 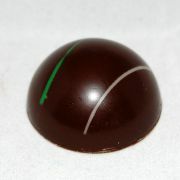 A touch of CrÃ¨me de Menthe helps to bring out the mint flavor, and add a perfect balance when coupled with the 60% dark chocolate shell. The flavor is reminiscent of my Mom’s homemade mint leaf tea. Our thoughts: Maybe our expectations were just all wrong with this one. I think we all expected an Andes mint taste or even mint chocolate chip ice cream type mint, but the mint in this was all wrong for us. It reminded us of toothpaste and just did not work for us at all. we universally disliked this one. Summary: Overall, these chocolates were delicious. A box of just Amaretto, Coffee Caramel, Dark Truffle, Passion Fruit, and Caramel would be heaven in a box! I wouldn’t hesitate to recommend Red Light Chocolates to anyone (just ask them to hold the mint). 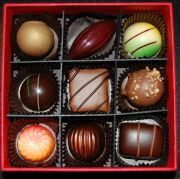 Their boxes range from $8.00 for a 4-piece to $45.00 for a $25.00 box – well worth it for some unique and delicious chocolates.